For official information and on radio, television and newspapers, the 24-hour system is used by the hour together with the word นาฬิกา นาฬิกา [na:-- li/ ga:--] = Clock. Example: ยี่สิบนาฬิกา [ji:/\ sip\ na:-- li/ ga:-- ]means 20:00 o'clock = 8 pm. On the other hand, in everyday conversation among Thais, the traditional system is used. 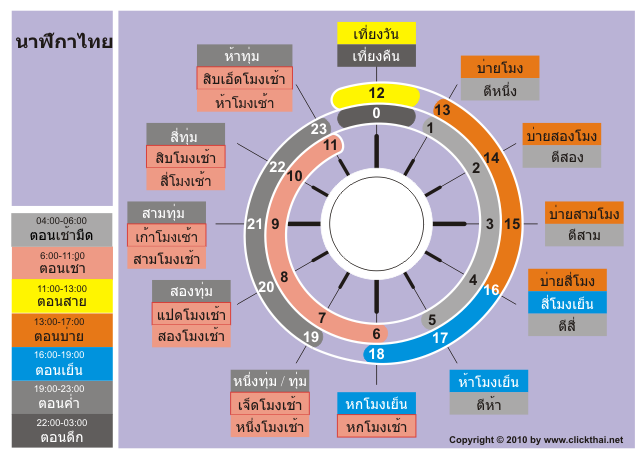 In any particular period the hours will be counted for this period starting from one: 13:00 o'clock is the first afternoon hour and is named บ่ายหนึ่งโมง (for the first hour หนึ่ง can be omitted = บ่ายโมง). 14:00 o'clock therefore is named บ่ายสองโมง = afternoon, second hour. From 19:00 to 23:00 o'clock (ตอนค่ำ) ทุ่ม is used: 20:00 o'clock, the second hour of the evening is สองทุ่ม. In the morning there is a difference in so far that they begin at 6:00 clock in the morning with หกโมงเช้า and are counted up to 11:00 clock สิบเอ็ดโมงเช้า. But the traditional system in which the hours are counted starting with one, is also common. However 6:00 o'clock in the morning is always หกโมงเช้า, the first morning hour 7:00 o'clock starts counting with one หนึ่งโมงเช้า or simple โมงเช้า, going on up to the fifth morning hour ห้าโมงเช้า = 11:00 o'clock. When stating the times, there are two systems used in Thailand. During everyday use a traditional system is predominantly applied, times are given on radio and television in a 24-hour format. The latter therefore understand all Thais, even if they tend to use the traditional system.